Get ready to be addicted by this new arcade game that was released on the Android platform not too long ago. From our personal experience, we can tell that the Falling Cat gaming app is one of the most fun games that can relax you and challenge you at the same time. Full of colorful and pleasing backgrounds and interesting sound effects, this game will make your free time more enjoyable, for sure. The gameplay of Falling Cat is simple, yet so challenging. You will quickly figure out how to play, but it will get more difficult with further playing. You play with the cute cat and you control it with tapping on your device’s screen. Tap and jump with your cat and try to avoid the obstacles that appear along the way – the spiky cactuses can make you lose the game. But not to worry, you can restart it endlessly. 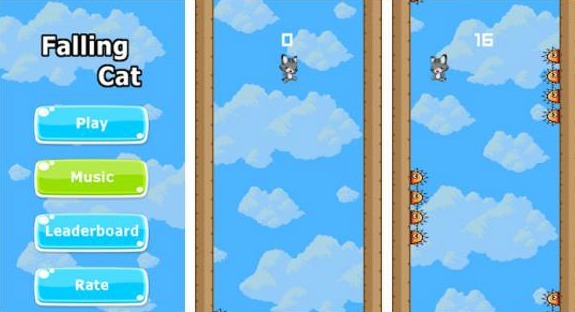 Jump right or left and play as long as you manage to keep your cat alive. Try to score higher, compare your scores within the online global leaderboard and share the Falling Cat gaming app with your loved ones. Enjoy an endless arcade fun by downloading the game for free from Google Play!